The Hmambukushu, also commonly called the Mambukushu, came to the northern region of Botswana from neighboring Namibia. Stories relate that the tribes migrated to the villages of the welcoming Botswana people such as the Baye because of internal strife in Namibia. Historical accounts relating to the migration include fear of traditional Rain Chiefs or Rain Makers reported to sacrifice small children and infants during their rain-making rituals. Political struggles were also involved. The Hmambukushu intermarried with the Baye and other peoples of Botswana and live side by side in the villages to this day. The accounts I have heard about these ladies Dishukeke wigs relate that at one point in Namibian history, the tribal ladies were forbidden my missionaries to wear their hair in the long, braided traditional manner. The braids were rubbed with animal fat and the missionaries thought the practice was unsanitary. The Dishukeke wigs where made to replace the lost hair style and make the ladies beautiful again in the traditional way. 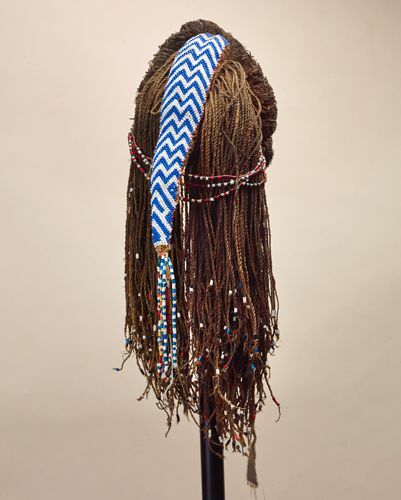 This wig was collected near the Mohembo Border-crossing between Botswana and Namibia, on the Namibian side.